RA Essential Oils: What Essential Oils are Anti-inflammatory? Rheumatoid arthritis (RA) patients use a variety of treatment categories to create a multimodal treatment plan which targets inflammation reduction and alleviates pain and stiffness. In addition to natural home remedies, prescription medications, physical and occupational therapy, exercise regimens and dietary adjustments, many patients also use essential oils to supplement their RA treatment plans. Essential oils can be effective at pain relief although they are not used to stop or slow disease progression. This is a natural or holistic treatment strategy that can be used in conjunction with prescribed RA medications. Before making any changes to your treatment plan, be sure to discuss them with your rheumatologist or treatment team to ensure there are no interactions with any medications that you are currently taking. Essential oils are derived and produced from the oils of certain natural herbs, flowers, fruits and other plants. They characteristically emit a strong, soothing fragrance or have a strong sweet or spicy taste. Essential oils have been used in joint pain and stiffness relief for thousands of years. Before initiation of today’s conventional pharmaceutical regimens, ancient Chinese and Indian medicinal practices used essential oils to treat a variety of symptoms including joint stiffness and pain. 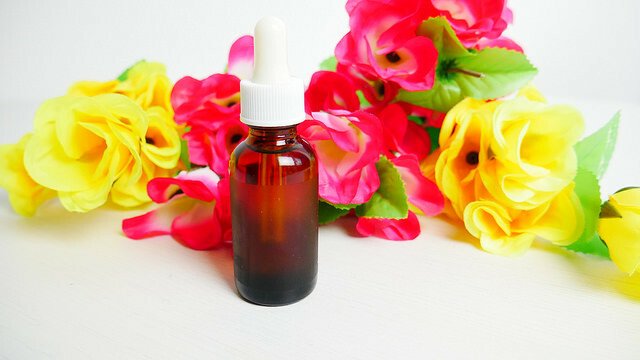 Today, essential oils can be purchased in a variety of formats including edibles, sprays, oil rubs, as well as in aromatherapy formulations like candles. Essential oils are extracted from the leaves, stems, flowers, fruits, and branches of various plants. They are rich in several different nutrients and minerals that can help soothe arthritis pain and inflammation. Some examples include Vitamins A, C, E and other complex chemicals and minerals. Several types of essential oils possess antioxidants and create analgesic and anti-inflammatory effects which are thought to help reduce inflammatory symptoms and alleviate pain in some individuals. When certain essential oils are used or ingested, they can specifically target joint inflammation and pain similar to a pain-killing medication or a nonsteroidal anti-inflammatory drug (NSAID). There are several types of essential oils that have been studied and historically used to help treat RA joint pain and inflammation. By adding these essential oils to your treatment regimen, you may benefit from these natural supplements which reduce or ease RA symptoms. These essential oils can be used as ingredients in your favorite recipes or in flavored water or tea to drink regularly. Peppermint is an essential oil with many health benefits including its ability to help reduce inflammation. Peppermint naturally contains several ingredients including menthol and limonene which are used for healing. Specifically for RA peppermint oils have natural analgesic, anesthetic and anti-inflammatory properties which help alleviate joint pain and stiffness. Peppermint can be added to water or brewed to make tea. Peppermint oil skin preparations can also be applied directly over the affected joint. Peppermint may cause side effects such as heartburn or nausea and may interact with certain medications. Caution should be used in pregnancy and postpartum as its effects during pregnancy and lactation are unknown. Essential oils derived from orange also have anti-inflammatory properties. As a citrus, orange has natural antioxidants which have been shown to be important dietary components for RA patients. The effects of orange oil as an antiarthritic treatment were studied and it was found that it can lower inflammation levels by interrupting inflammatory response in the immune system due to its antioxidant properties. Orange oil can cause photosensitivity, so avoid applying it to exposed skin before being out in the sun. Orange oil is considered safe in pregnancy and lactation when taken in usual food amounts. For years, people have used ginger as an antiarthritic treatment because it has natural analgesic and anti-inflammatory properties. In fact, laboratory studies have shown that certain ginger extracts can be used effectively to prevent joint inflammation and destruction. Ginger is root plant from which gingerol and nongingerol compounds can be extracted. Lab test results showed that when essential oils derived from ginger contained both these types of compounds, its use in treating RA inflammation was more effective. Ginger extract can be used to help numb, dull or alleviate pain. Ginger is used in cooking spicier dishes or for making beverages like ginger flavored waters and teas. Some potential side effects of ginger oil include heartburn, diarrhea, and stomach discomfort. Some women have reported extra menstrual bleeding while taking ginger. Using ginger during pregnancy is considered controversial. Some studies have been conducted on the use of certain varieties of Boswellia, also known as frankincense, in treating RA symptoms. Frankincense has natural anti-inflammatory properties and can be used to help RA patients reduce inflammation, pain, and stiffness. In laboratory testing settings, frankincense has also shown positive immune system effects. Frankincense can be applied as an essential oil topically or it can be chewed or mixed into water to drink. Potential side effects include some skin irritation. Safety of use during pregnancy and lactation are unknown at this time. Myrrh is another essential oil used for its antirheumatic properties to help treat RA symptoms. Myrrh is a gum derived from tree resin and has historically been used in several healing capacities to treat a variety of conditions. Myrrh has natural analgesic properties that make it effective as a natural essential oil for RA treatment. The use of myrrh oil combined with other anti-inflammatory essential oils can help to alleviate joint pain and stiffness. Myrrh is considered safe for most people when taken in small amounts. Potential side effects include skin rash, diarrhea (when ingested orally), and decreased blood sugar levels. Large doses are considered potentially harmful. Amounts larger than 2-4 grams can cause kidney complications and heart rate changes. Myrrh SHOULD NOT be taken during pregnancy as it can stimulate the uterus and cause a miscarriage. There is not enough information for usage during lactation, and therefore it is generally not recommended. Turmeric is a traditional Asian and Middle Eastern spice used in cooking and for healing properties. It has a prominent active ingredient called curcumin which has been found to help protect joints from inflammation. One study found that turmeric essential oil taken orally specifically relieved joint inflammation by reducing levels of one particular cytokine, or inflammatory messenger, in the immune system. Turmeric can be taken orally by creating turmeric teas or cooking with it as an ingredient in Asian style dishes. Most people do not experience side effects from turmeric usage. A small group of people may experience nausea, stomach upset, dizziness or diarrhea. Potential side effects include lower blood sugar, iron deficiency, slowed blood clotting, decreased testosterone levels, and worsened gallbladder problems. There are case reports of patients who took very large amounts (greater than 3 grams in one day) experienced an abnormal heart rhythm. During pregnancy, medicinal amounts of turmeric are not recommended (small amounts in meals as seasoning are likely ok) as it may promote a menstrual period or stimulate the uterus, causing a miscarriage. Turmeric is also not recommended during lactation. Essential oils for RA pain and inflammation can be used in several ways from spices in favorite recipes to a skin cream to lightly flavored beverages. Essential oils can also be impactful when combining several of them together to create a pain mixture. Certain essential oils have more analgesic properties, meaning they work as pain relievers, while others have more anti-inflammatory affects. These together work to alleviate pain while reducing inflammation levels. Frankincense and myrrh are two essential oils that work effectively together to treat help treat RA joint pain and inflammation. Research has shown that when combined together as one pain mixture, frankincense and myrrh are useful for suppressing joint inflammation and relieving the intensity of pain. Mixing orange and ginger essential oils together has also been known to help reduce intense levels of pain and stiffness in muscles and joints. Speak to your doctor before adding essential oils to your RA treatment strategy. Use pure essential oils sparingly as they may cause strong reactions in some people with digestive sensitivities. Essential oils are a natural supplement which RA patients can use to find a new pathway to relieve their pain and inflammation. By using essential oils in conjunction with prescription medications, physical and occupational therapy, and an overall healthy lifestyle, RA patients can continue to live a high quality of life through reducing overall levels of chronic pain.